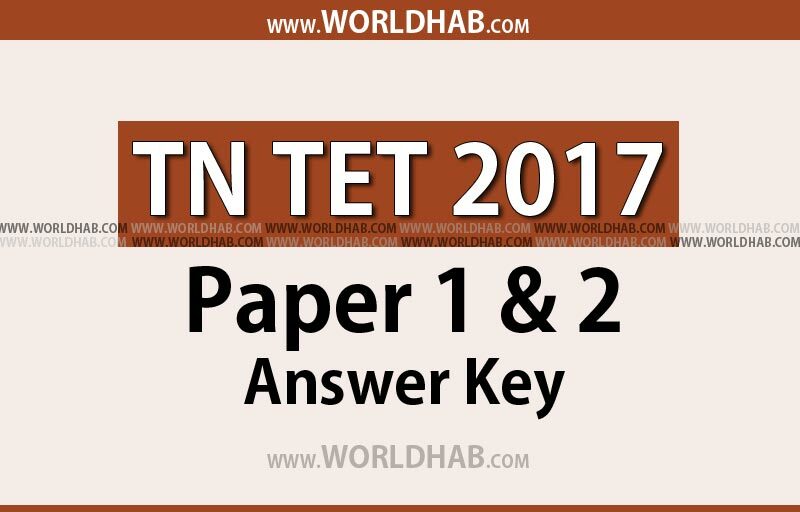 TNTET Paper 1 & 2 Official Answer Key 2017: The Government of Tamil Nadu arranged the Teacher Eligibility Test in this year without any remarks in the examinations. The Tamil Nadu Teacher Eligibility Test (TN TET) has conducted both the papers (Paper 1 for D.Ed & Paper 2 for B.Ed graduates) at various centres on April 29 and 30. According to the candidates, both of the papers have made with the tough questions. Meanwhile, the board released the Answer key and cut off marks of TN TET. So, the candidates those who all appeared in the examinations can able to download the TN TET answer key 2017 at the official website of trb.tn.nic.in. For the both of the paper 1 and 2, totally around 7 lakh candidates are registered for the TN TET 2017 examination. So, the government arranged nearly 2000 exam centres for the both examinations on April 29 and 30. The TNTET paper 1 examination conducted for the teachers of Classes 1st to 5th on April 29th Saturday and the Paper 2 examination conducted for the teachers of classes 6th to 8th on April 30th Sunday. The Teacher Recruitment Board (TRB) taken in charge to conduct these examinations of Teacher Eligibility Test in the various district after the order issued by the court. Due to various reasons the TN TET examinations are delayed and finally conducted in this year in Tamil Nadu. In the Paper 1 of TN TET, it consisted five sections and 150 multiple choice questions such as Child Development and Pedagogy (relevant to the age group 6-11), Language I, Language II (English); Mathematics; and Environmental Studies. The board given the choices of Language I with the Tamil, Telugu, Malayalam, Kannada, and Urdu. As like the same in the Paper 2 but with the syllabus up to eighth class. Initially, after the examinations, some of the private institutions have released the answer keys. Those answer keys are unofficial (individual) solutions which are solved by some experts. Now, the government released the Official TN TET Answer Key on May 22. Correspondence Course materials are not permissible.